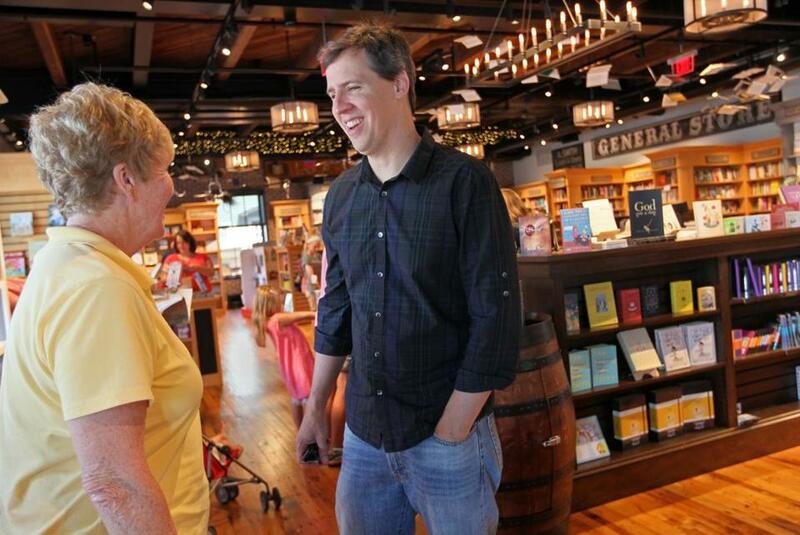 “Diary of a Wimpy Kid” author Jeff Kinney at his new Plainville bookstore. PLAINVILLE — Most of the preschoolers and kindergartners in the room recognize the song immediately and jump right in. “Open, shut them. Give a little clap, clap, clap,” chants the featured guest, a retired teacher who writes children’s books. Few of the kids take notice when a frazzled-looking man strides into the event, lugging a menacing-looking black motorcycle helmet with a full face shield. He stands in the back, anxiously surveying the gathering. “Did she refuse the microphone?” he asks an associate in a stage whisper, fretting aloud about whether the children can hear the speaker well enough. These kids are too young to know, but the guy with the helmet is a superhero to many of their older brothers and sisters. He’s Jeff Kinney, the author of the “Diary of a Wimpy Kid” series of illustrated books for middle-school students, one of the publishing industry’s biggest success stories of recent years. And he has every right to fuss over the other authors reading at the bookstore: He’s the owner. 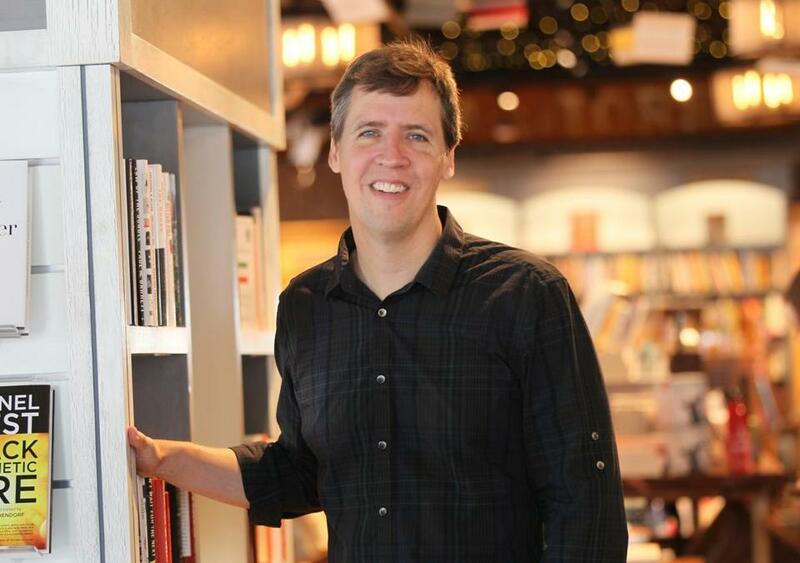 Author-owner Jeff Kinney spoke with a teacher at An Unlikely Story. 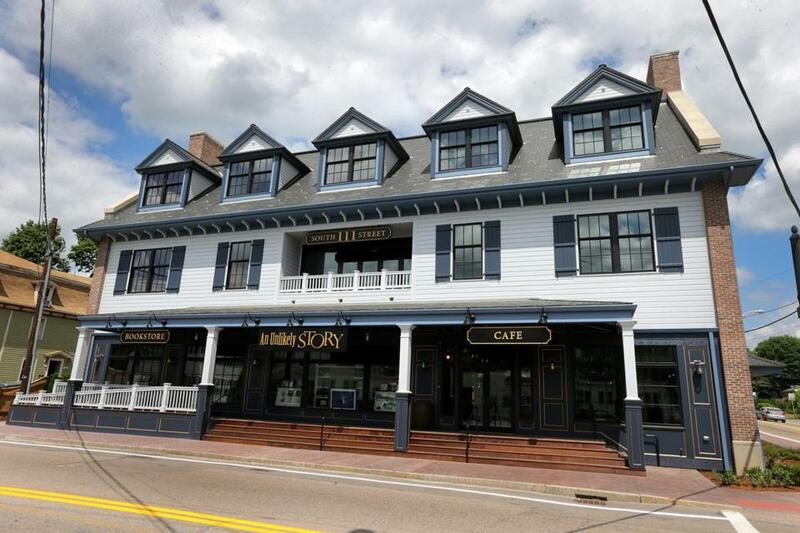 A little over a month after the grand opening of An Unlikely Story — the retail dream of Kinney and his wife, Julie, occupying the sprawling, three-story space of an old general store in Plainville — the author is still only getting about four hours of sleep a night. He’s on a tight deadline with the next installment of the “Wimpy Kid” series (the 10th), with an unprecedented international rollout planned for this fall. He’s helping design a new “Wimpy Kid” balloon for the Macy’s Thanksgiving Day Parade. He’s busy with the day-to-day operation of Poptropica, the kids’ gaming and exploring site he helped create. 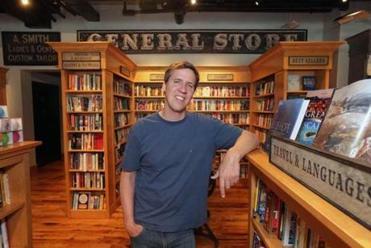 A ribbon-cutting ceremony was held Friday at an old market turned into a bookstore by children’s author Jeff Kinney. And he’s overseeing every detail of the store. Despite having hired a very capable staff, Kinney can’t resist. From tweaking book displays and sampling the wraps and snacks in the cafe to pacing the second-floor conference room, where he’s working on his own book until the contractors finish his state-of-the-art top-floor office (complete with a “Star Trek”-type door: “Why not?”), Kinney has been puttering around the block-long Federal wharf-style building when he should be drawing more Rodricks and Greg Heffleys. It’s been those simply-drawn middle-school archetypes that have earned Kinney the not-so-small fortune that has permitted his family to transform their adopted hometown of Plainville, population 8,000, here in the geographical armpit of Massachusetts on the Rhode Island state line, into an unlikely destination. As the bookstore’s name suggests, it is An Unlikely Story. An Unlikely Story occupies the sprawling, three-story space of an old general store in Plainville. But the emotional payoff has been immediate, not to mention the financial one. This day, a Friday around midday, clusters of parents and their preteens are shopping for beach reads. The cafe is filling up for lunch; a group of five teachers from North Attleborough is enjoying a coffee klatsch in the leather armchairs in the middle of the store. The neighborhood isn’t exactly picturesque. There’s a diner, which Kinney frequents, a few doors down, and across the street a storefront for Queen’s Nails & Spa. But the store “has been an unbelievable boon to the economy,” says Christopher Servant, the president of Bishop Feehan High School in nearby Attleboro. He’s been in three times already, supporting the business since Kinney made a fund-raising appearance at his school. Today he stopped by to see Linda Boyden, the guest children’s author, a former high school classmate and fellow Plainville native who now lives in California. 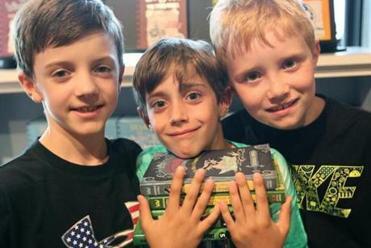 Braedon Reilly, with brothers Ryan and Evan Barker, of Norfolk, at the bookstore. Over by the checkout line, Allison Barker of Norfolk is completing a purchase as her sons, Evan, 9, Ryan, 7, and their friend Braedon Reilly, 9, stand by patiently. It’s their first visit to the store. “We were waiting for the swell to go down,” Barker says. She’s just finished paying for the day’s haul, $75 worth. Even after the e-book scare a few years ago and with significant book sales now taking place online, the number of independent booksellers nationwide is surprisingly robust. And according to the American Booksellers Association, children’s books reached record sales last year. Kinney and his architectural team tried to salvage some portion of the long out-of-business general store. “The building was decrepit. Not a splinter could be saved,” he says. So they brought in floorboards from the old Nutty Buddy factory in Dorchester and ceilings from a Kentucky tobacco factory. The colorful furniture lining the long front porch outside was custom-designed from boat wood salvaged from the 2004 Indian Ocean tsunami. “Everything has a story,” Kinney says. Thanks in part to the repurposing effort, the store has earned gold certification for its green building. 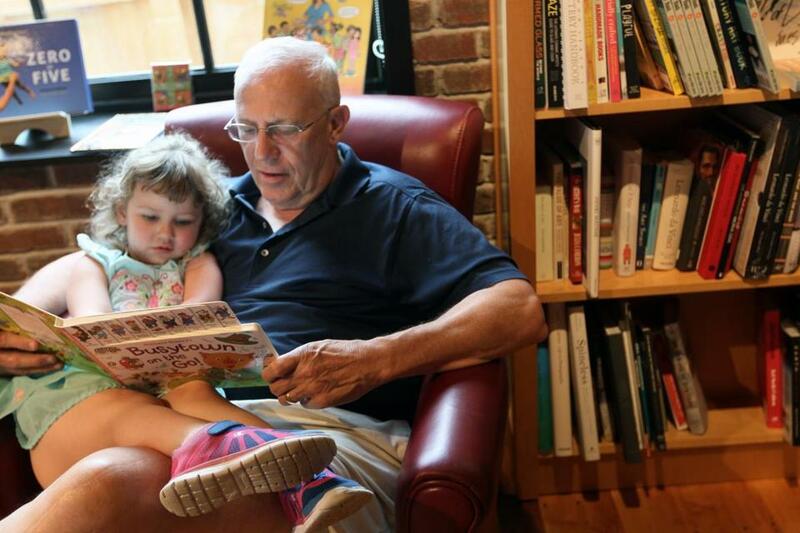 Tom Evans of Whitman read to his granddaughter Sulvie Evans, 3, of Franklin at the bookstore. In fact, the books whimsically suspended from the ceiling aren’t his own but titles from the “Harry Potter” series. Still, for kids of a certain age the store’s owner is another kind of wizard. There are more than 150 million “Wimpy Kid” books in print, in more than 40 languages. “I’ve read almost all of the ‘Wimpy Kid’ books,” says Jesse Peck, 9, of Westwood, who decided to come with his father and sister after they found the bowling alley closed. Jesse gets a free pizza if he completes his local library’s summer reading challenge, so he might as well stock up, says his father, Jon. When Kinney descends the staircase and pokes his head around the corner, a stunned-looking mother and her children beam and rush at him. Vacationing on Cape Cod from their home in Colorado, they brought their books with them in hopes of getting them signed, they explain. The books are in the car. He waits patiently as the family hurries out to the car, then signs their books by drawing his signature characters on the title page. “You’ve filled a wonderful vacuum in children’s literature,” Huppertz gushes as he signs. Now Kinney’s filled a vacancy in Plainville too. 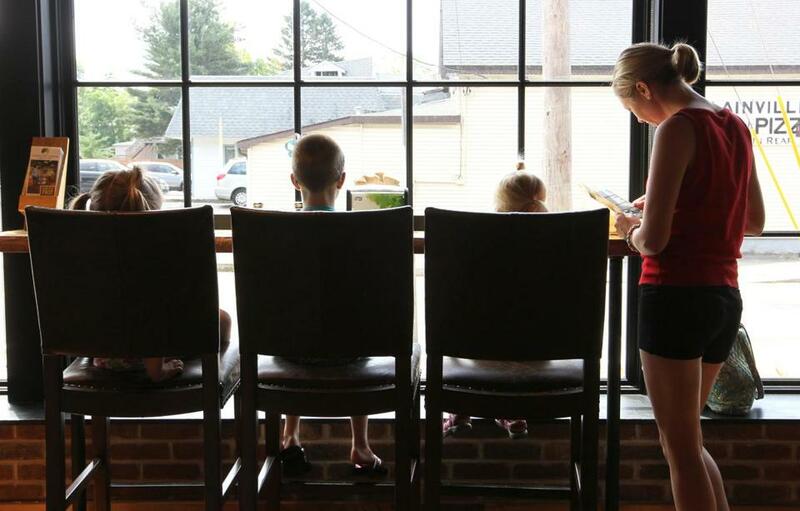 The Parah children of North Attleborough snacked with their mother, Olivia, at the bookstore’s cafe. An earlier version incorrectly described what Jeff Kinney is helping to design for the Macy’s Thanksgiving Day Parade. It is a new “Wimpy Kid” balloon.